Scottish Labour Party Manifesto 2011 - Save Scotland from copy cat politicians. WATCH THE VIDEO Labour getting absolutely slaughtered on BBC Newsnight Scotland. Is the mass media finally coming round to the SNP? For the BBC to expose the failings of the Scottish Labour party, their manifesto and Iain Gray as the leader. By using the biggest political film and series "IN THE THICK OF IT" which was based on Tony Blair's Labour Government lies and deception. Is in our opinion is most fitting and does show that the media can no longer protect Labour from their incompetance. Why because Scottish Labour Party MP's and MSP's have job security issues and are therefore prepared to follow the London Labour Unionist line, to put down Nationist ideas and the facts of Independence at every opportunity so they can keep their English masters happy. However Iain Gray proves on this video his weak divided party are unable to keep the Scot's happy. Voting for the London controlled Scottish Labour Party is a vote against Scotland! If you cannot bring yourself to vote SNP because of your left wing roots, please vote for the Scottish Socialists. 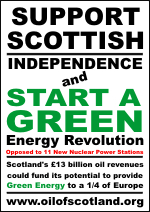 Alternatively think Green and vote for the Scottish Green Party as they are both parties who are not opposed to home rule / Scottish Independence. A leading Professor of Economics, Andrew Hughes Hallett, has sensationally confirmed that Scotland has been subsidising the UK treasury in London for years and that the Calman Commission recommendations are unworkable and potentially damaging. Professor Hughes Hallett (pictured) also rubbished claims by leading Scottish Labour politicians that an independent Scotland could not have survived the banking crisis by explaining that much of the liabilities suffered by HBOS and RBS would have fallen on England. Hughes Hallett, who is a Professor of Economics at George Mason University in Washington DC and St Andrews University was appearing on Radio Scotland’s ‘Newsweek’ show when he undermined much of what Unionist politicians and Scottish media commentators have been saying about Scotland for years. Full story and video of interview at Newsnet Scotland. Norway is a smaller oil producer that Scotland with harsher North Sea conditions. Norway 'petroleum fund' tops $500bn. More on Labour Party corruption. The European Union costs every UK Citizen £234 a year. The UK Union costs every Scottish resident £2300 + a year. In 1999 Labour and Liberal Democrats secretly made 6,000 MILES of SCOTLAND'S SEA - ENGLISH by moving Scotland's marine boundaries from Berwick-up-on-Tweed to Carnoustie. 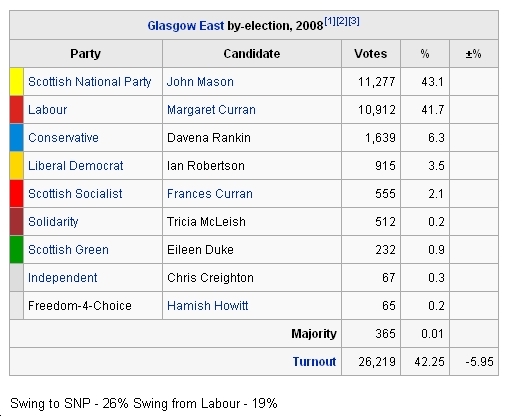 10 MAY 2010 Gordon Brown Resigns - but what about the Scottish people who voted labour? That the pro Scottish parts of the Calman Commission are to be put into place immediately. Reverse the secret order that Labour's Henry McLeish put through in 1999 that made 6,000 square miles of Scotland's Sea English. That took 15% of oil and gas revenues out of the Scottish sector of the North Sea. Thus taking £2.5 Billion per year out of the Scottish Economy which is more than the proposed credit crunch cuts proposed for Scotland. Suggest that Trident is scapped and force the MOD to be accountable to SEPA. To allow SEPA to regulate the nuclear submarines at Faslane that have leaked untreated nuclear radioactive coolant in the Loch more than 40 times. After all it is our oil and gas revenues that are stopping the UK debt being junked. Gordon Brown you also had the mandate to allow a well over due Scottish Referendum on Scotland's future. So what did you do for your 83.9% of Scot's who voted for no Tory rule in Scotland, before you let the Conservatives rule Scotland. That's right, absolutely nothing ! VOTING FOR ANY UNIONIST LONDON BASED PARTY IS DANGEROUS FOR SCOTLAND'S HEALTH & WELL BEING. 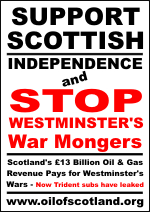 Scottish public services face £35 billion cut over next 15 years, as a non Independent Scotland will give London a minimum of £210 billion over the next 15 years in oil and gas revenues alone. Full story on these Scottish Public Services budget cuts. The Scottish Labour Party USED to have left wing socialist values, but in attempt to win in England "new labour" are moving closer to the centre/right. Having said that, credit where credit is due the Labour Party did give us the Freedom of Information Act. They also have not taken the part in the McCrone report that examines the Scottish Economy without North Sea Oil and implemented it like Margaret Thatcher did. However they did help keep it secret even when Scotland got her devolved Government, that she should have been given 26 years before. If it was for the Labour Party perverting democracy with their unheard of 40% rule. Margaret Thatcher was most annoyed that she could not build a pipeline from the North Sea to England, however Tony Blair came up with an alterative when he made 6,000 miles of Scottish Sea English in 1999.
Who knows in the future, Conservative leader David Cameron may attempt to use Scotland's Green Energy to attract overseas business to the North of England rather than Scotland! The Labour party HQ unveil two manifestos. A 78 page manifesto for England that promises more for English voters than the second class 75 page manifesto for Scotland. Most of the issues in the Scottish version of this 2010 general election manifesto are not even within Westminsters' control ? At Glenrothes, Labour shamefully campaigned on matters that devolved Scottish Government deal with. This manifesto proves they are going to campaign in Scotland with unjust, unfair, misleading policies that do not relate to a Westminster election. Yet another injustice against residents of Scotland by a non transpartent Westminster Government. 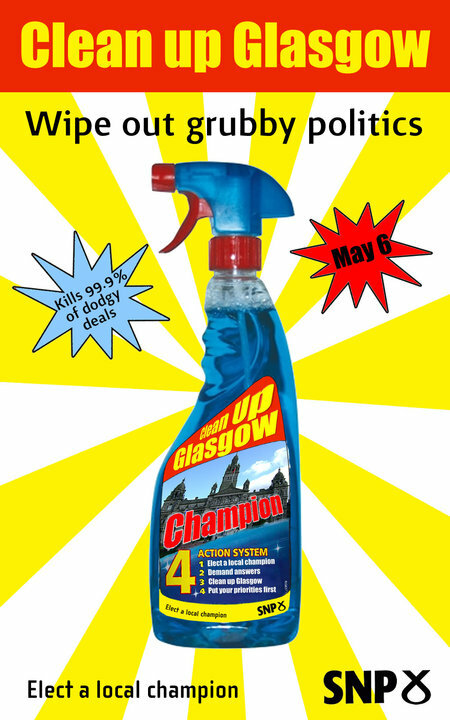 What is going on at Glasgow City Council ??? In March 2010 headlining stories have been generated regarding the mysterious resignation of its Leading councillor. What is going on with our money? Iain Gray, Scottish Labour Party leader in the Scottish Parliament, was embroiled in a sleaze row after it emerged one of his campaign donors had improperly benefited from public funds. East Lothian Council said it was investigating how about £6700 of public resources were directed to Prestonpans Labour Party to help it stage an annual fundraiser, despite council rules forbidding it. Scotland must see through the smoke screens caused by the loaded gun held against the heads of Scots who vote for London based parties. The alternative for Scotland's future is bleak. In a Independent Scotland the right wing Conservatives would have little chance of being elected. In yet another "Snap Election" set for the 6th May 2010, the Conservatives will more than likely be elected, despite labours efforts to convert Scot's voters for their own personal and political gain on the opposition benches of Westminster. In Scottish Politics it has been the "anti Scottish" Labour Party who have been holding a smoking gun against the heads of a lot of people in Scotland who are misled into voting Labour. This gun has been repeatedly loaded with lies, non discloser, spin and unfounded SNP smear campaigns. We hope at the next election or referendum those destructive forces at work within the London Labour Party will not get the chance to reload their machine gun of smear, lies and deception. 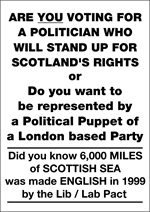 Did you know that in 1999 The Labour and Liberal Parties made 6,000 miles of Scottish Sea English. The Labour party also overturned the will of the Scottish People who wanted a devolved Government in 1979. In this 1979 Referendum 52% of Scottish voters said Yes to a devolved government. (32.7% of the Population) - To elimate any chance of a devolved parliament the labour party imposed a 40% of the population must say yes ruling. However if the entire population had voted the same way which was unlikely by the Labour Parties fondness of disclosure of forth coming elections. More than 52% not 40% of the population would have said yes. The only election in the World where the dead and foreign students who had gone home were given an automatic NO vote. Why? So Scotland could continue to give London £22,831 a minute, £32 million a day, £12 billion a year in oil revenues LOCK STOCK AND BARRELL. In return for robbed seas, discarded industries, failed employment policies, larger dole queues, a large amount of the population living in poverty and bad health. Along with daily lies and spin spread by Newspapers controlled by people with an allegiance to Labour due to the threat of the Conservatives. If you are over 30 years old and had lived in Scotland for 30 years, you have allowed £48,000 that could have been spend in your name to improve Scotland go to London, since oil and gas revenues started coming in. Scotland still has the worst health record and the worst poverty in Europe. The Sun Newspaper have dumped the Labour Party Whether this is a publicity stunt to attempt to sell more newspapers or the Sun newspaper feels it needs to back political winners. The fact that the Scottish Sun have said they will not back the Conservatives, unlike the English edition, would suggest the winners in Scotland will be the SNP. Who knows maybe the Sun will once again back the SNP like they did in the 1980's. If you do not agree, please watch the short videos on this page before leaving. Should Scotland become Independent Country, a new treaty of Union could easily be written among Wales, Northern Ireland and England. As Her Majesty the Queen is also the Queen of Scotland, the Monarchy would also in not be jeopardy as Union of the Crowns would exisit. Therefore Scotland becoming completely politically Independent from Westminster would not affect any Loyalist ideals, what so ever, unless the people of Northern Ireland and Wales no longer wanted to be associated with Westminster and England. MINIMUM ALCHOL PRICE PROPOSALS - EXPOSE SCOTTISH LABOUR AS OUT OF TOUCH. The Scottish Labour Party have done nothing in 30 years to curb Scotland's drinking problems, they used to agree with the principal of minimum pricing on alcohol, but never implemented any drink restriction laws whilst in power. The SNP government, who are addressing the issues of the people of Scotland, have proposed minimum pricing and restricted point of sale for alcohol, similar to the sale of tobacco in supermarkets (i.e. not at super market checkouts). Did Labour MP's and Labour Scottish MSP's discuss this at the Labour Conference 2009? Labour wants to build new nuclear power plants in Scotland when the World's uranium is unlikely to last another 30 years. When Scotland has the capacity to provide green renewable energy to more than a 1/4 of Europe. Now they are going to use the Calman Commission to enforce the renewal of Trident on the Scots. Labour have wasted Scotland's Oil Revenues, by not investing the modest amount required to invest in the Oil industry that Westminster so heavily relies on. Labour has got the Country in £750 Billion of Debt. On a population basis Scotland's share of the debt is only £62.5 Billion, which North Sea Oil Revenues that Westminster currently wastes, would pay the Scottish share of that debt off in 5 years. Labour and the Liberals have allowed Westminster to move Scotland's Marine Boundaries, making 6,000 miles of Scotland Sea, English and the revenue from the Gas and Oil fields in these waters be counted as English revenue. Labour has done nothing for the Scottish People in the last 30 years, accept put us seriously in debt. As well as overturning a democratic decision of the 52% of the Scottish Voters who said yes to a devolved Scottish Government in 1979. Then ignoring 43 out of 19 Scottish MP's who voted against the London Labour Party ruling. If you are Scottish and support the Labour Party. You need to examine seriously why you are allowing English Labour Politicians to un-democratically manipulate Scotland for the benefit of England through the Scottish Labour Party with lies, secrets, scaremongering and scandals? Should Scotland become Independent Country, a new treaty of Union could easily be written among Wales, Northern Ireland and England. Unless the people of Northern Ireland and Wales no longer wanted to be associated with Westminster and England. Once Scotland got it's Indepenence, Iam sure the people of Scotland would not mind if the Union Joke, sorry Union Jack still remained as icon for the British Isles, to avoid having to change a lot of computer systems. As Her Majesty the Queen is also the Queen of Scotland, the Monarchy would also in not be jeopardy as Union of the Crowns would still exist. Therefore Scotland becoming completely politically Independent from Westminster would not affect any Loyalist ideals, what so ever. The monarchy is more likely to survive in Scotland than it will in England, as there are those amongst who actually have a vacant chair waiting for the return of the King of Scotland. 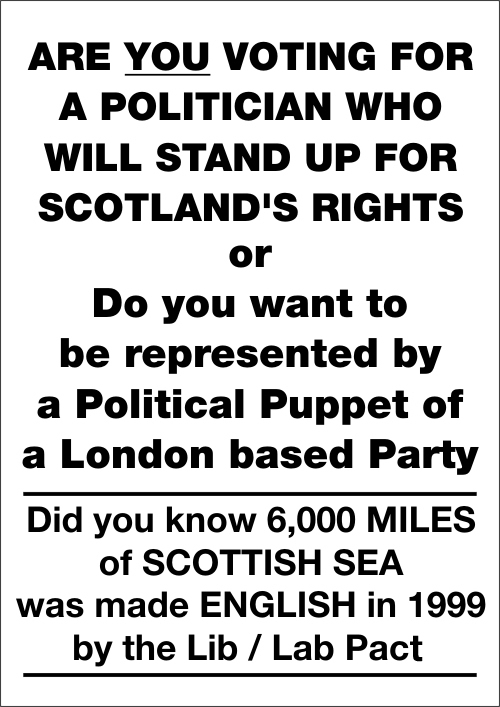 In a Independent Scotland, a Scottish Labour Party would be controlled by Scots and not English Puppeteers. Free of London Labour control, the Scottish Labour could work in partnership with other Scottish Ministers, rather than against them. A Independent Scotland would more than likely have a "real" left wing Labour Government after Scotland's First Election. The difference would be the lack of back stabbing - cover up - lying - commands from South of the border. Working with SNP would be much easier if the Scottish Labour Party did not have to employ these underhand Unionist strategies, that come from the London Labour Party. In a Independent Scotland, Scotland's 59 MP's would not have to share an eleventh of the political table with other Countries decision makers. In a Independent Scotland "The Scottish Labour Party" could be a leading credible force that would help the English voters realise "left is best". In a Independent Scotland nothing much would change "same Monarch - postal system - rail networks - prisons - same money - same local taxes - in short term the name UK could remain as an another term for Britain or Great Britain, to avoid a computer industry headache. The Population of Scotland, could still, if they prefer refer to themselves as Britons - British. As British Isles is the name of a landmass. In a Independent Scotland the slight changes would be fairer tax systems - a lot more revenue from natural resources - better standard of living - feeling of hope in our oppressed population - more head offices in Scotland - a say in World Politics - Scotland's oil and fishing industry regaining the 6,000 miles of Scottish Sea stolen by Tony Blair in 1999. - a full say in Scottish Politics and purse strings to sort Scotland's problems - a say in Scotland future as a nuclear dustbin, host and main sponsor of Trident. The way forward for Scottish Labour Supporters is simple download this "Scottish document" and have your say as a Scotsman in Scotland's future. Alternately you could continue to follow your English Shepard's. 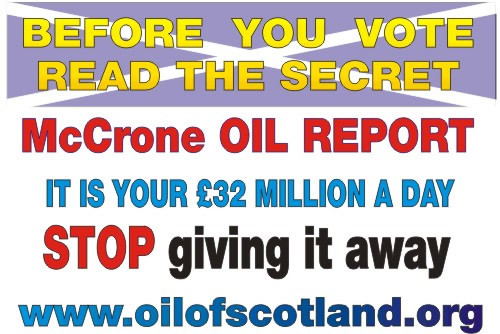 Before you vote, read the McCrone Report It is your £32 Million a Day Oil and Gas Revenue - stop letting Scottish Labour give it away. UK Government debt has risen to £750 Billion. That equates to every new born child being £17,000 in debt. Scotland could be debt free in 5 years. If the people of Scotland vote for Independence in 2010 the amount of that debt that would be attributed to Scotland would be reduced to £62.5 billion, as Scotland's population is a twelfth of the size of the United Kingdom. As Scotland currently receives no Scottish Oil and Gas revenues worth approximately £13 Billion per annum, this new money could pay off Scotland share of the debt in less than 5 years. Iceland is bankrupt because of reckless banking practices. Why then did the Labour Government suggest that UK Local Councils invest vast sums of public money "offshore" in Icelandic banks. Now Labour have inflicted the Anti-terrorism, Crime and Security Act of 2001 law against the Icelanders. Why do English Labour and through them Scottish Labour insist on bending the truth or telling flagrant lies. The answers are Oil !!! 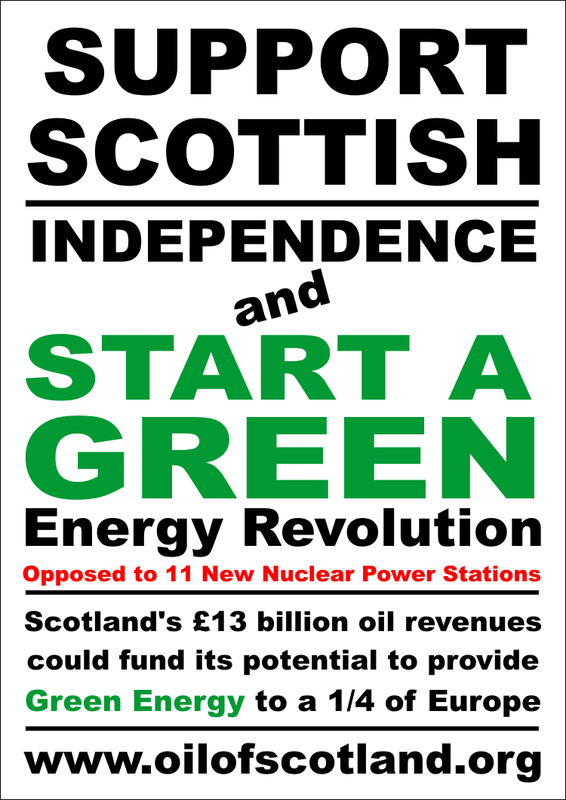 Nuclear Scotland and top stop the Conservative Party taking power? If you care about Scotland say YES to Independence in 2010. - Within 6 Months Scotland would have a general election where one could vote for their usual Party. Then the Scottish Labour Party true left wing can take control of Scotland. Labour overturned a democratic decision in a Democracy. However before the election took place SDP, MP George Cunningham had proposed that 40 % of the electorate must vote Yes, thus effectively counting abstainers, the dead, foreign students who had left the country as No voters. 32.9% of the electorate had voted Yes, only 7.1% short of the 40% rule. Of the electorate who had voted 52% voted Yes 1,230,937 opposed to the 1,113502 who had voted No. At the time of the referendum there was 62 Scottish MP's, 43 of them voted Yes and 19 voted No. The Act was repealed the following month (March 1979) despite Scottish MP's voting 43 to 19 against repeal. Had the same conditions been imposed on the 1975 EEC referendum, Scotland would have left the EEC. This is the first time in a democracy that the decision of the voters who turned out has been over turned. Even in a third world African Nation, democracy is not destroyed to the extent it was in 1979 by Labour Government. Who after years of stalling on the 1974 manifesto promise to hold devolution referendum's in Scotland and Wales imposed this unfair, unjust ruling that was instigated purely to rig the referendums to interfere with the right of the Scottish and Welsh people to govern themselves. The sense of betrayal that the Scottish electorate felt was unrecoverable for the Labour Party and a vote of no confidence in Callaghan's Labour government 27 days later was carried by one vote. The Labour Government collapsed and Margaret Thatcher swept to power where the Conservatives remained until 1997 despite having virtually no support in Scotland. For the last 30 years the Scot's have not received very little if any revenue from Scotland's Oil. The Scottish people are given an allowance based on taxes like income, corporation, inheritance, VAT and Council tax. This allowance does not even add up to the amount the treasury demands from the Scots. He has used Alex Salmonds' 2005 comment about the Arc of Prosperity, relative to the Iceland Banks against the SNP. However when this comment was made about Iceland, Gordon Brown was encouraging Councils throughout the United Kingdom to invest Millions of TAX PAYERS MONEY in Icelandic banks for big interest pay outs. Money that until the collapse of these banks was probably being used for under the table bonuses. It now turns out the UK Government has given £759million to the FSA to BAIL out the Iceland banks. i.e. it is the UK tax payer that is funding this operation to bail out Icelandic Banks NOT the Icelanders, who have had anti terrorism laws imposed upon them. Labour have taken comment of the Norwegian Minister and twisted them so much that the Norwegian Minister wrote a letter to distance himself from what Labour was doing by twisting his comments. Read The Norwegian Ministers Letter condeming his comments being twisted for unionist political gain. The speed that Gordon Brown announced the "damaging" merger between Lloyds TSB and HBOS was of a political gain to discredit a Scottish Bank and strip it of its ancient Scottish Identity so he could boast where will a Independent Scotland be without one of its biggest banks. He now boast where would Scotland have found the 100 billion to bail out the banks - 100 billion / 60 million (UK population) x 5 million (Scottish Population) is only 8.3 Billion. This is proved by Gordon Brown's statement that if the Lloyds TSB merger did not go ahead neither would the 13 billion tax payers bailout. Q. So where would a Independent Scotland find 8.3 billion to save its share? Labour won the Glenrothes By Election on the back of the charges, that some high income residents are being asked to pay for home are by the SNP Fife Council. The fact that over 1000 people in Fife have had to pay no charge and that these charges are less than they are in Labour controlled Councils did not feature on the "Dishonest Labour Propaganda" that was distributed throughout the Council and in the media, days before the election. The question is how much money did the Labour Party spend on the Glenrothes by election Campaign. We would suggest a full investigation into Labour's Glenrothes Budget and the Home Care charges in Scotland, after all in a Independent Scotland a lot of Labour MP's fear they would lose their jobs, this does not have to be the case if Scottish Labour supporters support Scotlands right to govern itself. 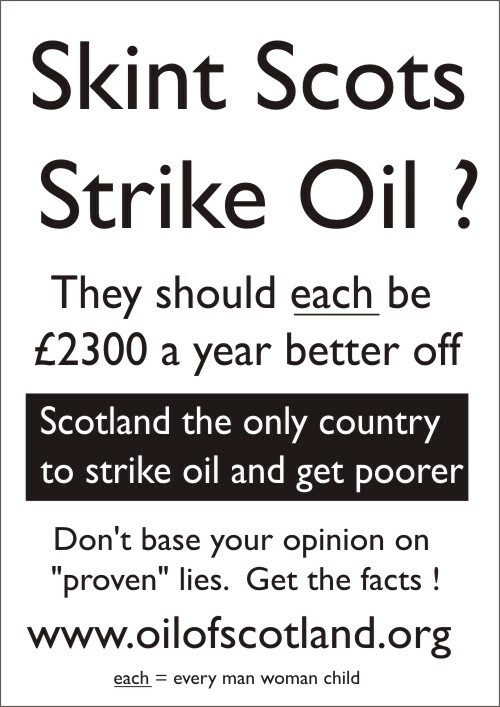 Scottish Oil is worth defrauding the Scot's, breaking International laws and lying for! The fact that in 1979 Labour said no to the 52% of Scottish Voters and 43 to 19 Scottish MP's said YES to devolved Scottish Government at Holyrood. The fact that in 1999 Tony Blair moved Scotland Marine Boundaries without consulting the Scottish People. Moving them from Berwick-upon-tweed to Carnoustie making 6,000 square miles of Scottish Sea, English. These facts prove this, so do not listen to the Unionist lies. The full significance of North Sea oil was not immediately apparent, and it still remains in large measure disguised from the Scottish public by the DTI..
2009 JUNE 15 - UNIONST - CALMAN COMMISSION URGE THAT HOLYROOD SHOULD TAKE CHARGE OF HALF THE INCOME TAX RAISED IN SCOTLAND. As the number of tax payers has and is going to fall due to Labours disgraceful management of the Credit Crunch. The Unionist's intend cutting £5 Billion from the Scottish Budget and expect the Scottish Government to make it up from Scottish tax payers who can manage to hold on to their jobs. When Westminster impose the Billions to be cut from the Scottish Budget in the years to come, it will mean the loss of NHS and Government jobs. Making it even harder for the Scottish Government to make up the £5 Billion slashed from the Scottish budget. This £5 Billion figure is based on the current working population, not the working population after the full effects of the credit crunch and government spending cuts announced on the 23rd of April 2009 by Jim Murphy come into place. 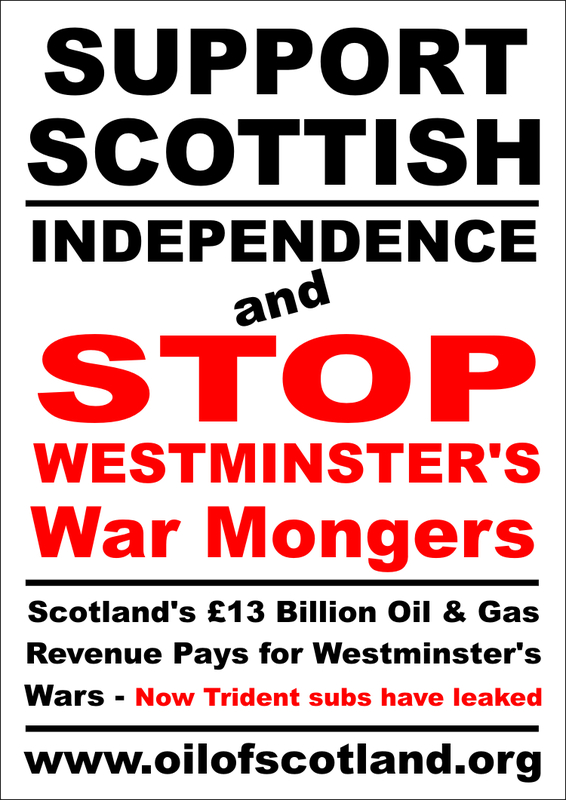 On the same day, Westminster announce credit crunch plans to increase Scotland's North Sea Oil production by 20% adding another £2.6 Billion onto revenues that London takes away from Scotland, which was £13 Billion in 2007. The solution is simply vote for SCOTTISH INDEPENDENCE and a budget of in excess of £45 Billion not the Unionist's slap in the face reduced £25 Billion budget. Watch this video on Faslane and Trident - then read the myths behind Scotland needing employment from Faslane. No sane sensible Scottish family could substantiate giving all of their salary to their neighbour only to beg for the scraps from their table for sustenance!!! Scottish budget to be cut by £0.5 Billion. While Scotland's North Sea Oil production is to be increased by 20% adding another £2.6 Billion onto revenues that London TAKE AWAY from Scotland, which was £13 Billion in 2007. This year the Scottish Budget of £33.3 Billion is calculated using the Barnet Formula which gives, back a proportion of "non oil & gas taxes" raised in Scotland. In a Independent Scotland the available money for a budget would be a minimum of £49.5 Billion, when Scottish Oil and Gas revenues are added. This figure is not including the massive revenues from Scottish renewable energy and the industries renewable energy will attract to Scotland, the billions saved from ditching Trident and all the taxes raised in Scotland not just some of them. Scottish Labour Party S...p, should distance themselves from their London Labour Party Shepherds, before the Conservatives get in. Aliaster Darling plans incentives for North Sea Oil exploration so the UK Treasury can make another £2.6 Billion out of Scotland - whilst also planning to cut Scotland's Budget by £1 Billion. A Bannockburn by-election to replace disqualified Stirling councillor Gerard O'Brien on the 30th of April. The Labour politician was banned from office for 18 months by the Standards Commission on 5 March for breaching the Councillors Code of Conduct. Gordon Brown leader of the Labour Party and his main advisor get caught planning a smear campaign of opposition politicians. Westminsters strips Scotland of it financial asset- as proven by Dunfermline Building Society. It is blatantly obvious that Gordon Brown, the London Westminster based Labour party are striping Scotland of its Financial Assets as proven by ignoring the more info Lets have an inquest If Scotland had been a Independent Nation, it would have been highly likely that the Scottish Govenment would have questioned banking policies, as banking is one of Scotland's largest industries. They would have probably have asked the banks to protect themselves and their customers by seperating investment banking from retail banking. It would also probably have asked Scotland's big bank's to review their easy lending policies as much of its lending would still have been done South of the border. Following a dramatic Council by-election win in the Maryfield Ward on the 13th of March 2009, the City of Dundee is poised to become the first SNP-led City administration. Craig Melville trumped the Labour candidate by over 500 first preference votes to take the place of ex-Labour Councillor Joe Morrow (who wasnae in when I canvassed his address!). The balance of power would appear to be in the hands of Independent Ian Borthwick. What way will this man swing? Or will one of the other minor parties vote to keep their jobs. 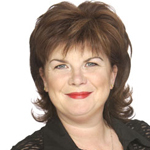 LABOUR has suspended constituency business in East Lothian because of a row surrounding attempts to deselect the MP Anne Moffat. The development could potentially be an embarrassment for Labour's newly elected Scottish leader, Iain Gray, who is the MSP for East Lothian. 250,000 tonnes of radio active waste from London's 2012 Olympic site to be dumped in Falkirk, Scotland. Maybe this SNP voice could condemn the "Secret decision to dump 250,000 tonnes of RADIO ACTIVE waste from the London 2012 Olympic Site in Landfill in Falkirk". 2008 09 25 - The date of the Glenrothes by election has finally been announced for the 6 November 2008, 23 days after all the candidates have been selected. This announcement only gives the electorate in Glenrothes only 42 days before election day. The Electoral Commission said that Labour's recent Snap elections should be banned to give the public enough time before polling day to register to vote. Labour is having difficulty finding a candidate to fight this by-election. So far, three leading candidates have said thanks, but no thanks. * Henry McLeish (ex-MP and MSP in Fife and First Minister). * Christine May (ex-MSP for the area, lost her seat in 2007). * Alex Rowley (Labour leader on Fife Council, ex-Secretary of the Labour Party in Scotland, and a Brown protege - think Douglas Alexander and add an extra "Fife" dimension). 2008 07 24; “Re count ordered by Labour Candidate Margaret Curran"
2008 07 24 "Labours Scotsmen Prime Minister Gordon Brown MP or Westminster's Chancellor Alistair Darling MP have both failed to come to Glasgow East Scotland, to lend there support to Labour's Campaigners and the fellow Labour MP's and SMP's that have been drafted in from around the United Kingdom more"
2008 07 22; “David Cameron Westminster's Conservative Leader comes to Glasgow East." Wendy Alexander is banned from the Scottish Parliament for a day for receiving illegal donations then she resigns. The Leader of the Scottish Liberals Nicol Stephens resigns within a week of the Scottish Labour's Leaders resignation? Could this be why Labour are rushing this local election through in three weeks (the fastest known By-Election) and have it in the middle of the Glasgow Fair holiday so that turnouts are low. Leaving the people of the East End of Glasgow less than a week to register for a postal VOTE. Europes oldest political newspaper first published in 1926. Get 1000 copies for only £10. Just visit their facebook profile for details. Do your bit and take the Holyrood election campaign to the letterboxes. Non English speaking residents of Scotland, please use this translator. The Scottish Economy report Westminster made top secret for 30years. In 1974 the Conservative Government commissioned a report into the Scottish Economy that they and future Westminster Governments classified Top Secret as it is reported that Scotland could and still could be one of Europe's richest Countries. Take the unionist challenge and read this report pdf or read the official censored version. 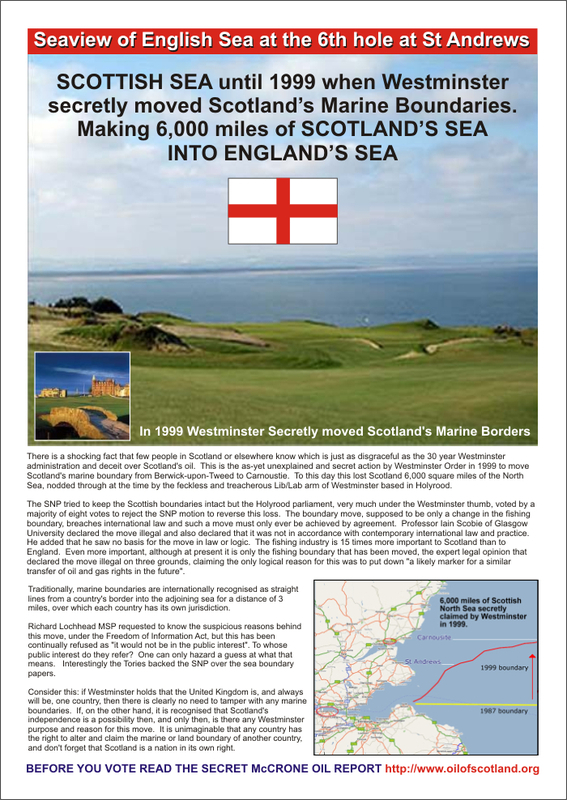 In 1999 Westminster moved Scotland's Marine Boundaries from Berwick-upon-Tweed to Carnoustie. Therefore when you play golf at St Andrews and look out to sea, you are looking at English Waters according to the treacherous Westminster powers that be. The only Scottish bank left please support this society.